These cafe curtains have been a labor of love (and sometimes frustration) for the last 10 months. *hangs head in shame. I am very good at starting projects, sometimes it just takes a long time to finish them. 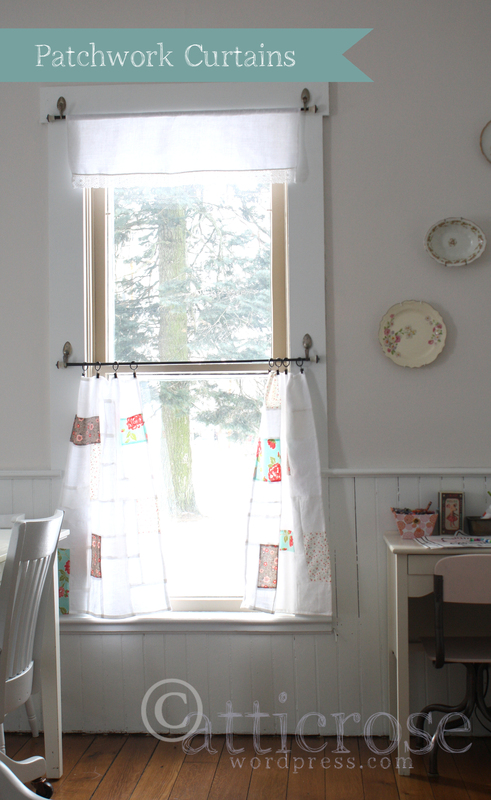 I knew I wanted patchwork and my Mom suggested cafe style curtains. I used two old linen tablecloths and bought some fabric to add a little bit of color. Next, I got out my handy-dandy graph paper. 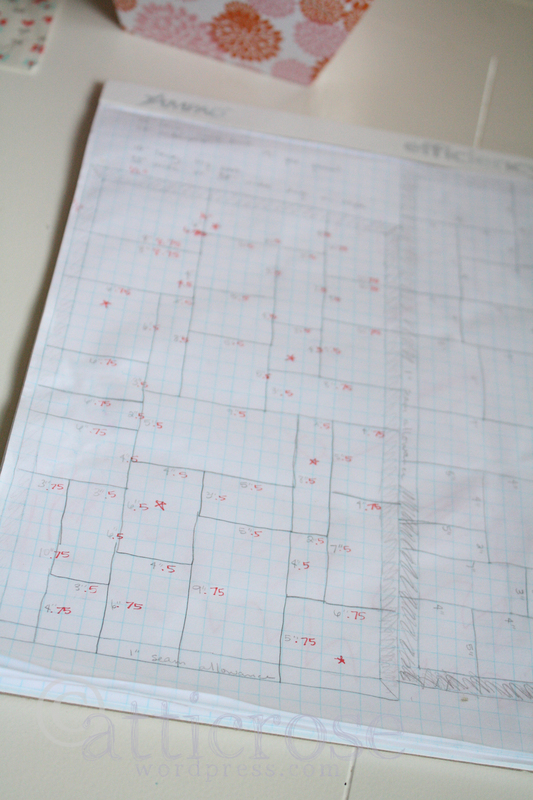 I love graph paper. It makes planning and sketching fun. I figured out how big I wanted each panel, then just drew in the shapes. After that, I added seam allowances and started cutting. You can tell that I didn’t iron the old tablecloths before cutting them. I probably should have. 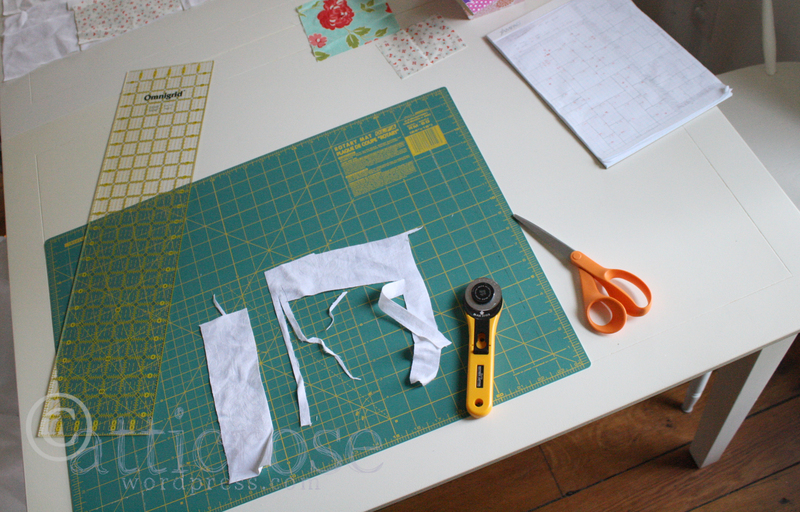 After cutting, I had to zig-zag or surge around each piece. This is when I started realizing what a big project I had started. 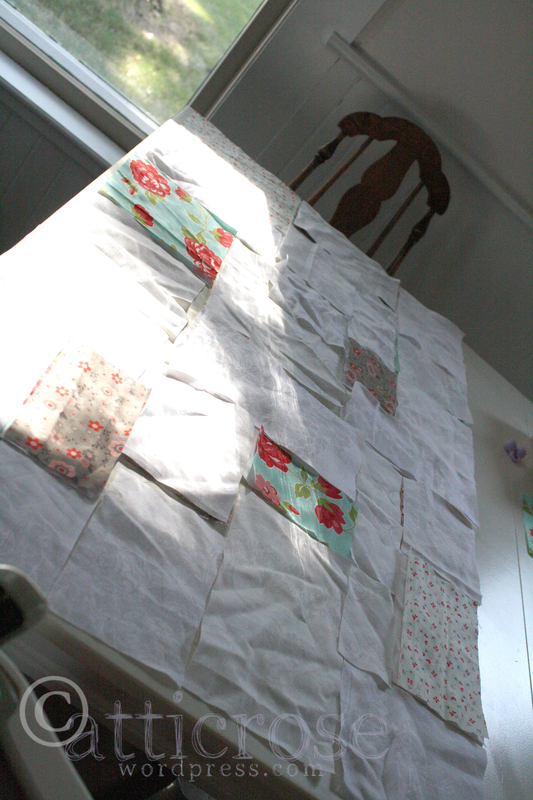 I thought about putting a thin backing on the curtains and not worry about all that sewing. I ended up zig-zagging around each piece. I felt like any more material and seams would make the curtains too stiff to hang nice. 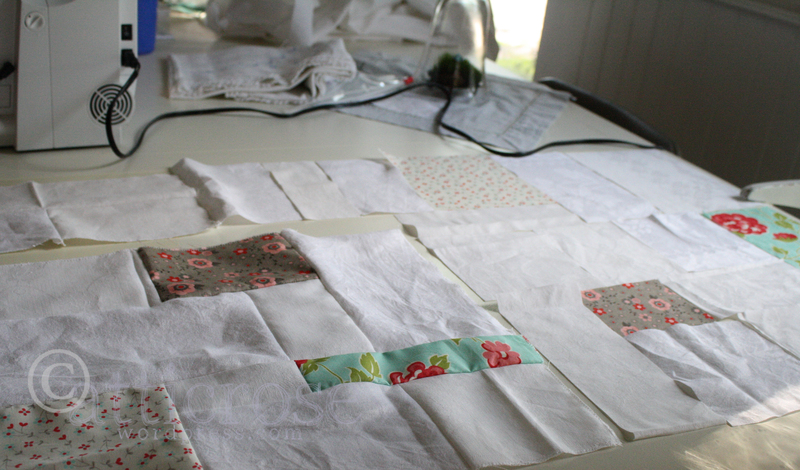 Then I sewed the pieces together. This was my favorite part. It was like putting together a puzzle. Although by the sixth panel, it wasn’t as fun. None of the curtains are the same. I chose to put the colored rectangles/squares in a random order. For rods, I chose cheap, Oil Rubbed Bronze rods from Lowe’s, and popped off the ends. 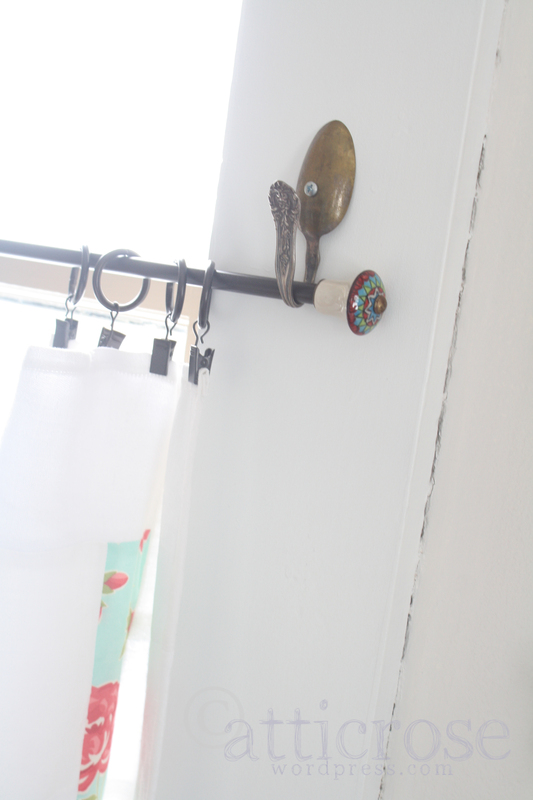 I used knobs from World Market for the ends of the rods. I used gorilla glue to glue them on. So far I have had to glue one back on. We bent some old silver spoons to hold the rods in place. The clips used to hang the curtains are from Target or Lowe’s in the ORB finish. Here is a more detailed shot of the knobs/rods. 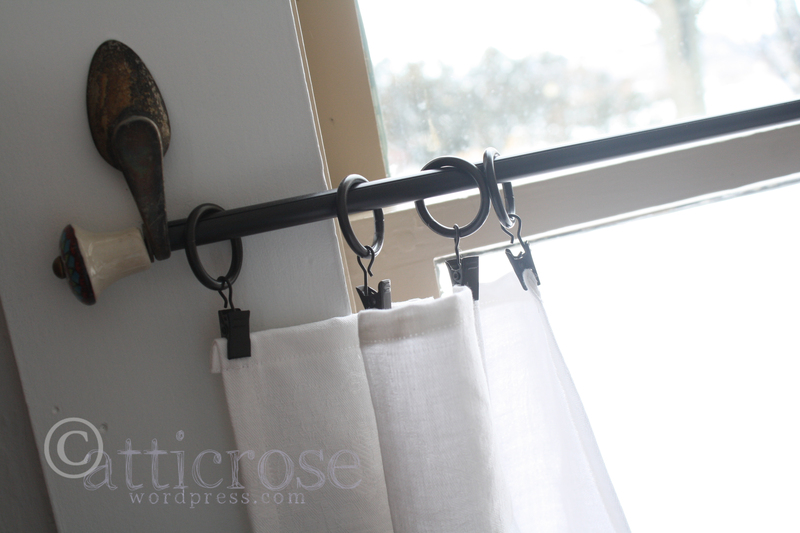 Once J. had bent the spoons, I started hanging rods in place. It took me most of a day to get six rods hung. We have three windows in the kitchen, and so each window needed two. 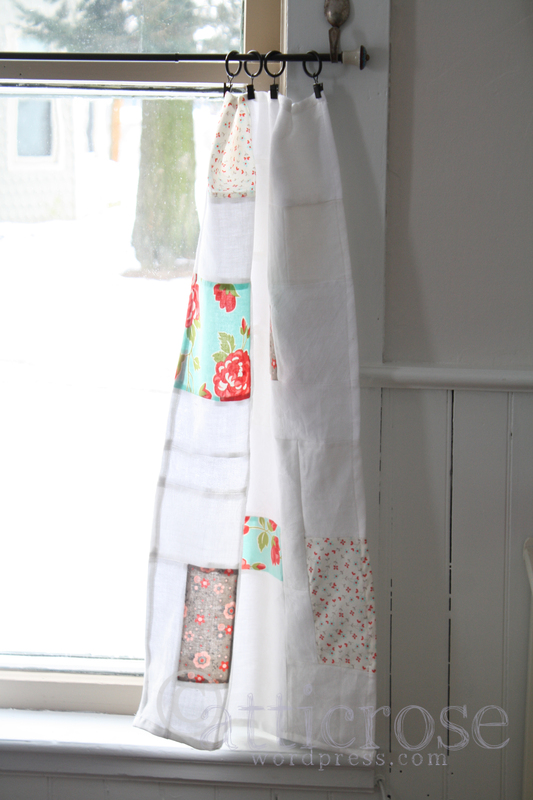 For the top curtain, or valance I used the same old tablecloths. J. advised me to keep them simple. I love when he gives me ideas. 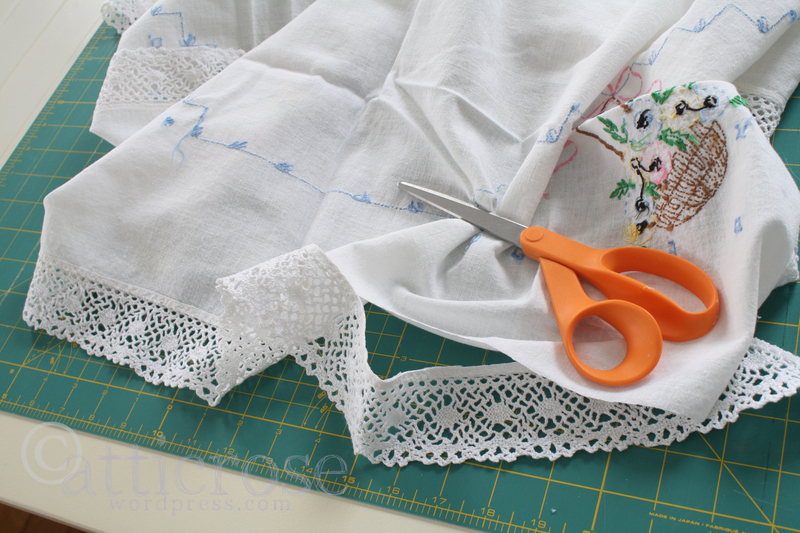 I cut the lace off of this old, stained cloth to trim the bottom of the curtains. 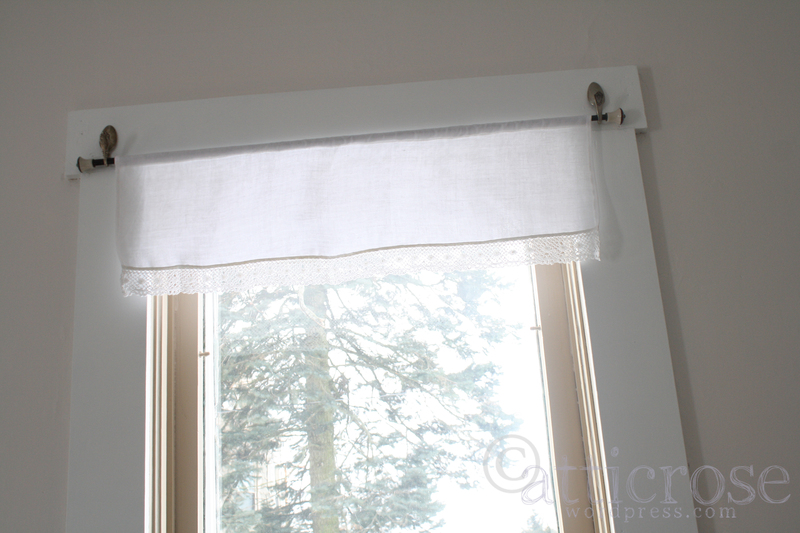 A finished valance. The lace with the old tablecloth material turned out a little wonky, but I think it’s okay. Sometimes when I make things out of old stuff, they are less than perfect. I am learning to appreciate things just as they are. I would rather have old and imperfect. The finished product. I am very happy with how it turned out. I’m not sure that I’d do it again, though. But, who am I kidding? I totally, probably would do it again. Carrie, I’ve been admiring these curtains where I’ve seen them in the background of a few of your pictures.They make me want to open the window and see them flutter. With a freshly baked pie cooling in front of them. 🙂 I love them!